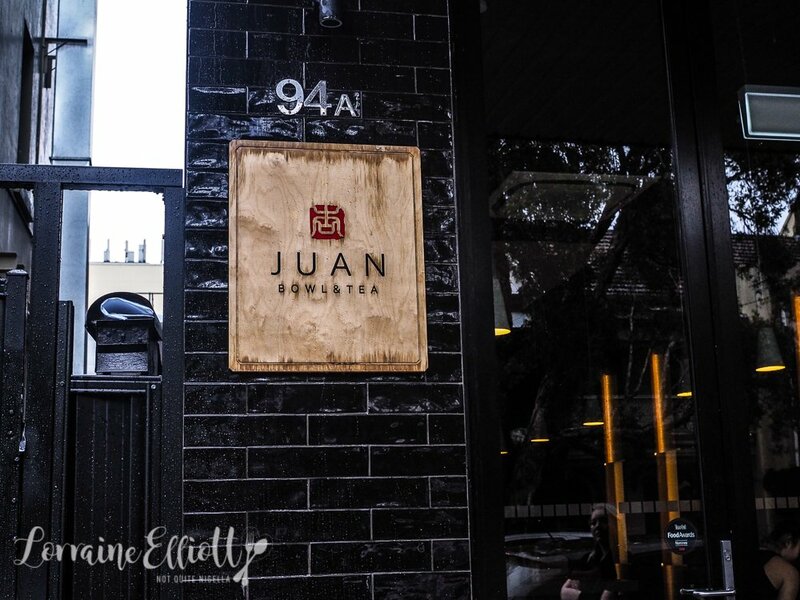 The idea behind Juan in Redfern is simple. 4 bowls, matching tea and sake and exquisitely presented food. 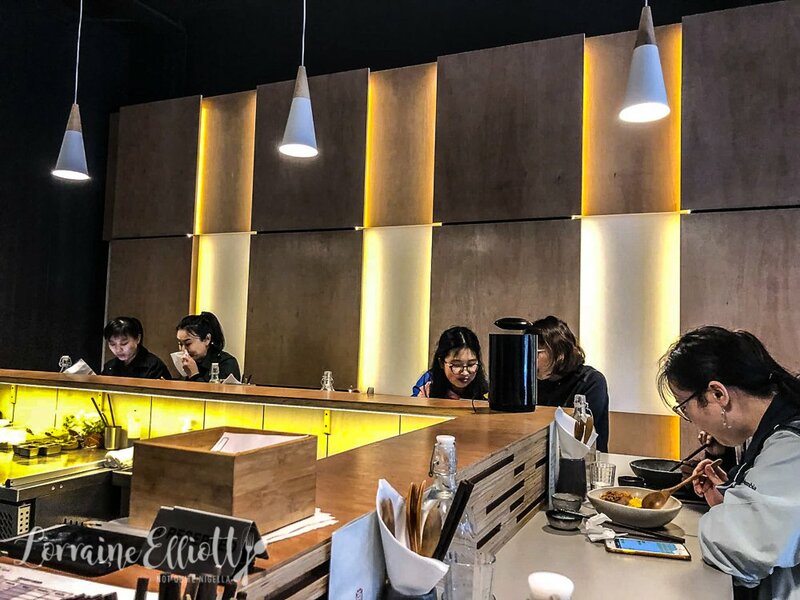 This small Japanese 28 seater restaurant has a bar area, three tables and a large share table. And even having a choice of four dishes makes things hard as you just want it all! 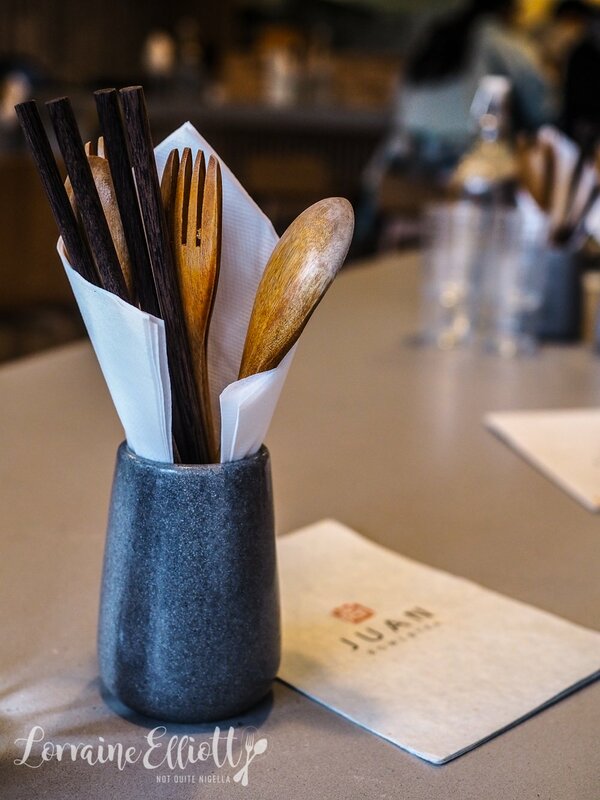 I had been warned from a friend that one needed to be in possession of a booking at Juan. So much so that they take bookings for lunch (hooray!). It's a rainy September day when I arrive and I thank my lucky parking feathers for the parking spot right outside and take a seat. The restaurant is half full even at 2pm (the earliest booking time we could get). Girl Next Door arrives a few minutes later. Service is Japanese style i.e. polite and deferential. We are shown the menu of four dishes and are politely asked to order at the counter which is where you pay. 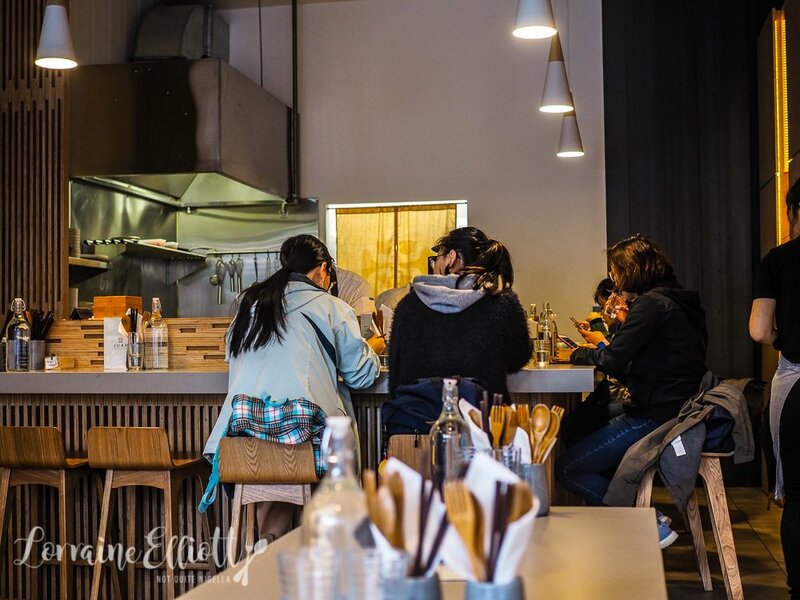 The owner and chef is Anna Ishiguro, formerly a graphic designer. We had been advised by my friend Black Widow that we may want to share three bowls between the two of us cause they aren't excessively large bowls. This ends up being fine because we actually wanted all the food (note to self: bring more people). You can also get the bowls without rice so we order the tonkatsu without rice. The food comes out shortly afterwards. The tonkatsu sans rice is first. 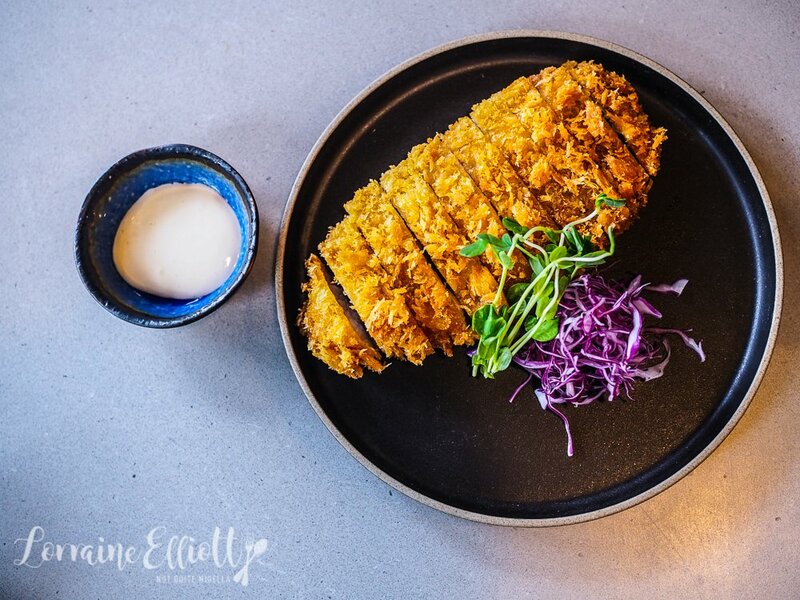 It's a crispy, light crunchy Bangalow sweet pork fillet with the perfect amount of fattiness to the fillet. The pork is slow cooked and is usually served on a bed of rice with onion, scrambled eggs, house apple mustard mayo, roasted tomatoes, red cabbage and miso sesame sauce. I dip it in the mayonnaise that it is served with and it melts in my mouth. I sort of wish I had ordered it with the rest of the items though as they sound delicious and I thought I was just not getting the rice. 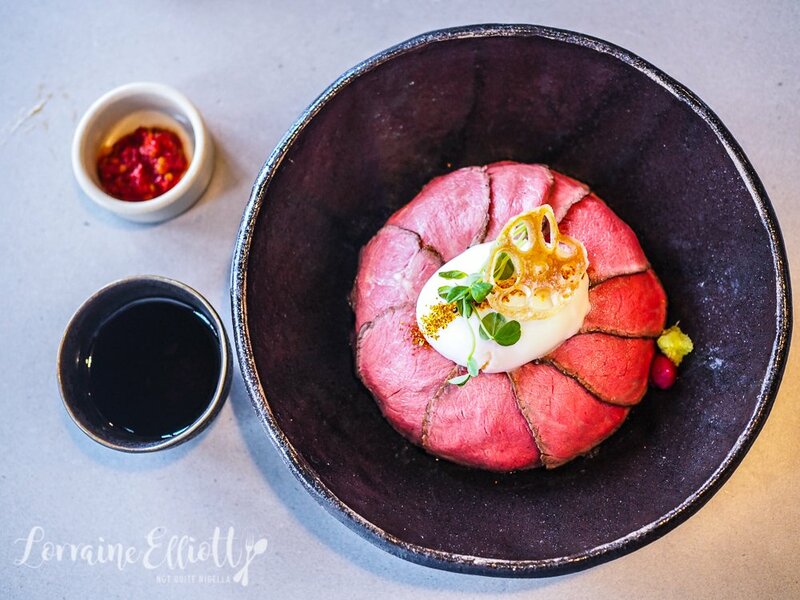 Girl Next Door's favourite dish is the wagyu bowl and it is such a pretty dish. It's a 12 grain rice with garlic butter sauce. 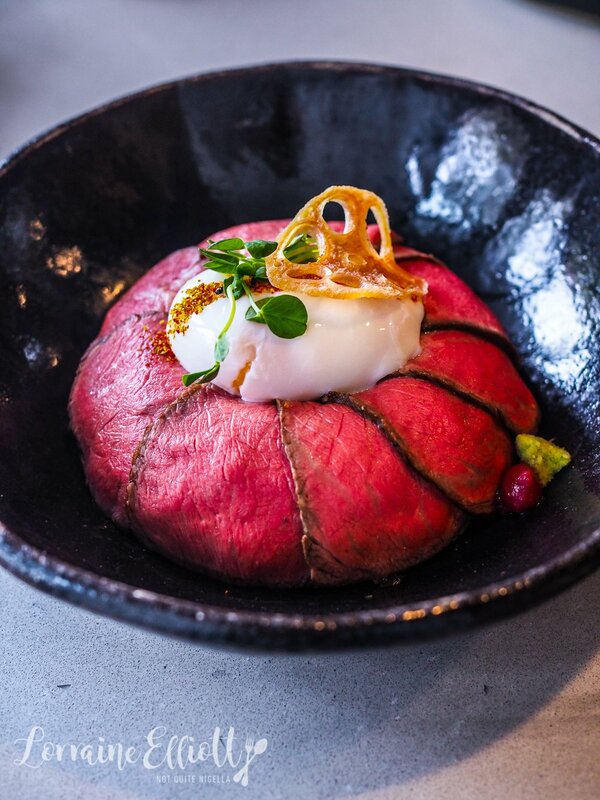 On top of this are slices of 2 hour slow cooked wagyu roasted beef, a free range onsen egg lotus root chip, beetroot miso, wasabi, snow pea sprouts and onion sauce. As luck would have it, I get the whole serve of wasabi in one bite (I'm not a big fan of wasabi) whereas Girl Next Door doesn't get any. Still it is a lovely dish and beautifully presented like a flower. There is a choice of koshihikari (Japanese rice) or 12 grain rice (similar to a red or brown rice) and I go with the koshihikari for the Hainan chicken. It's another beautifully presentd dish and is my favourite of the three. 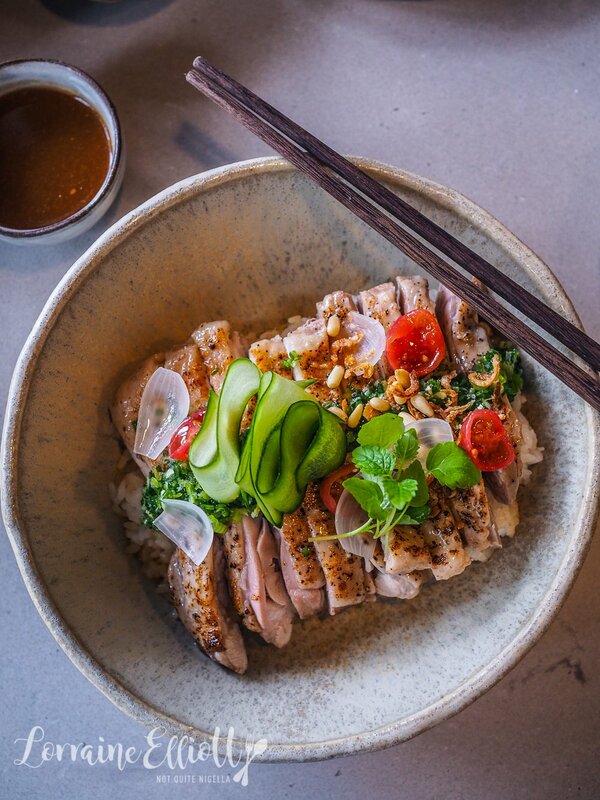 It's super tender and juicy grilled organic chicken with pickled shallots, cucumber ribbons, halved cherry tomatoes, onion petals and toasted pine nuts on a bed of lemongrass, ginger and soy rice with side bowls of ginger shallot sauce and chilli sauce. I love the flavour of the rice and the tenderness of the chicken. I ordered my matcha latte to come with the dessert and it's a large cup served with sugar syrup on the side. I clutch the knobbly textured cup and keep warm. 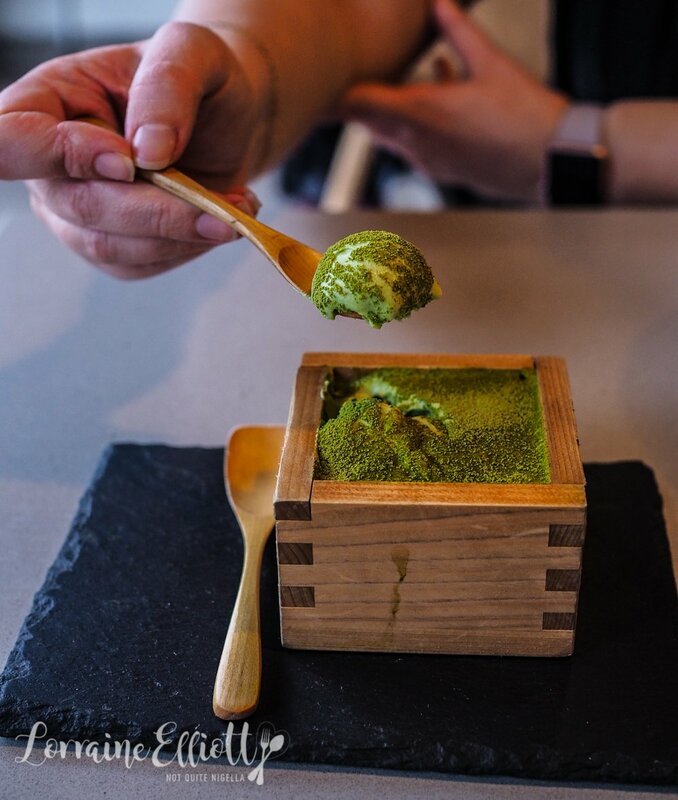 I had seen many pictures of the matcha tiramisu cleverly served in the wooden sake box. It's layers of matcha and soft biscuit and mascarpone. 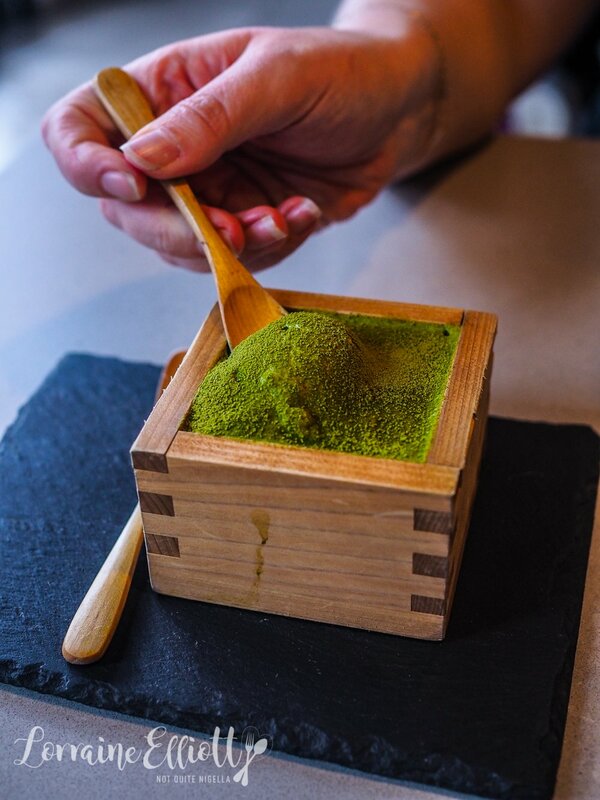 It's for matcha enthusiasts as it doesn't shy away from the matcha flavour at all. So tell me Dear Reader, do you like short or long menus? 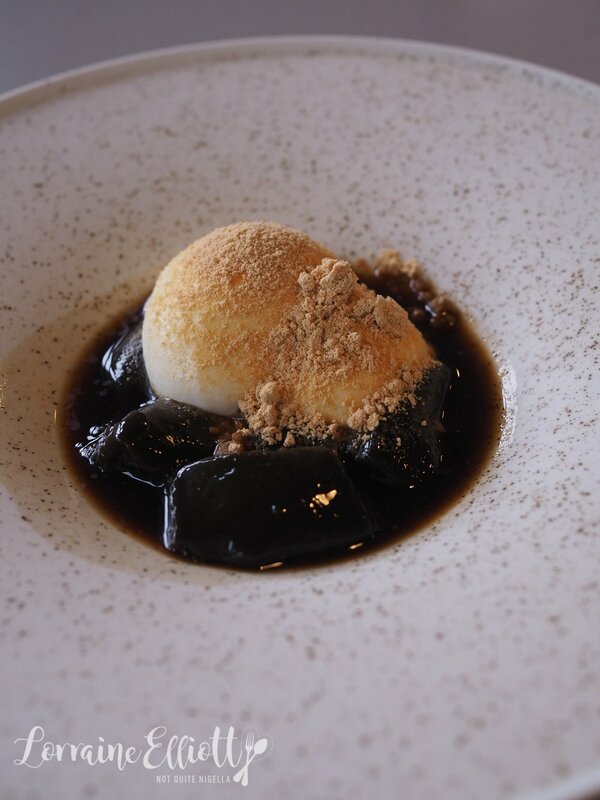 Have you ever tried warabi mochi? 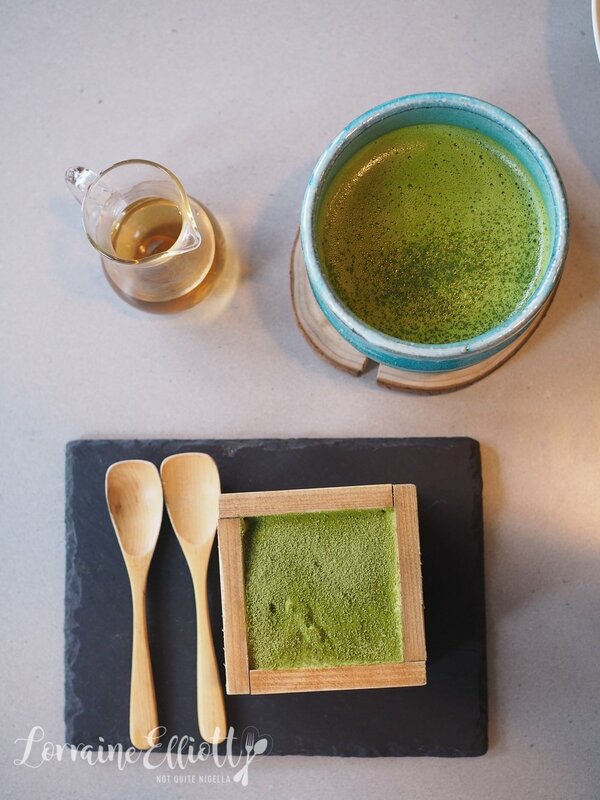 Do you prefer a strong or mild matcha flavour?